Just Romantic Suspense: Researching "the strip"
Congratulations to "LS", the winner of Kat Martin's giveaway. Thank you to all who participated. For years I wrote historical romance novels. The time-frame and settings demanded a lot of research. Now I’m writing mostly Contemporary Romantic suspense and the odd thing is, in a different way, they required just as much research as the historicals. 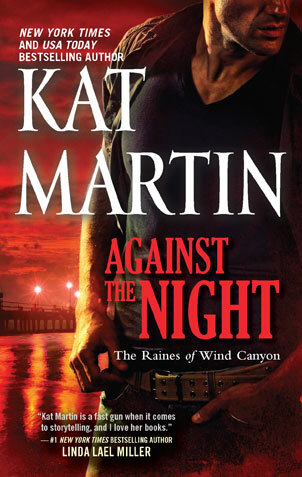 For AGAINST THE NIGHT, my latest release, out the end of February, my husband and I headed for Los Angeles. Of course, having been raised in the San Joaquin Valley about a hundred miles away, I’d spent a lot of time in L.A. and pretty well knew my way around. But AGAINST THE NIGHT is set on the Sunset Strip, and I wanted to refresh my memory and also learn a little more about the night life on the Strip. The novel is Johnnie Riggs’ story, the fifth in my AGAINST series, that started with Against the Wind. Johnnie’s an ex-Army Ranger turn P.I, whose specialty is the underbelly of the city. He knows the Strip, lives and works in of an apartment that looks out over his domain. In a place called the Kitty Cat Club where he’s working on assignment, Johnnie first spots Angel Fontaine, a petite blond exotic dancer. From the moment he sees her, John Riggs wants her in his bed. The problem is that Angel Fontaine is really Amy Brewer, a kindergarten teacher from Michigan, a young woman risking her life to find her missing sister, whose job she has taken in the club. For our research trip, we stayed at the London West Hollywood, a swanky hotel just off the Strip that caters to rock stars, international travelers, and the hip crowd. A great place for a writer to just sit and do some serious people watching. My hubby and I went to dinner at a restaurant called Boa our first night in town, kind of an in-spot for the neighborhood. The next night we walked the Strip. What a fun experience that turned out to be! Not only did it help me get a feel for the area, but as we were meandering along, we walked into a large, old-fashioned bookstore, long-established in the area. I had just hit the New York Times for my second AGAINST book, which my hubby told the booksellers and they were really excited for me. So excited they insisted we stop by a little offbeat restaurant they said had great Mexican food and they were sure we would love. We almost didn’t go. It was getting late and we were leaving for home in the morning. Then we thought, what the heck? Let’s go inside and at least say hello. We were glad we did! The booksellers had called ahead and the owner was waiting--with a flight of some expensive brand of tequila, which he insisted we drink to celebrate the Times list. I’m a wine drinker normally, but this just looked like fun and so we tried it and it was amazing. I was glad when the food arrived and the booksellers were right--the meal was delicious. Or maybe everything just tastes wonderful after a few shots of tequila! I hope you’ll look for AGAINST THE NIGHT and that you enjoy Johnnie and Amy’s story. After that, AGAINST THE SUN will be out the end of May. Kat will be giving away give away a copy of Against the Night to one lucky commenter. The winner may choose from Kindle, Nook or paperback format. Giveaway ends 9pm EST Feb. 28th. Please supply your email in the post. You may use spaces or full text for security. (ex. jsmith at gmail dot com) If you do not wish to supply your email, or have trouble posting, please email justromanticsuspense @ gmail.com with a subject title of JRS GIVEAWAY to be entered in the current giveaway. Romantic suspense is my favorite genre. I have beed a long time fan of yours! Thank you for your research, Kat. Nothing irritates me more than reading an error on something that could have been easily Googled. I realize I'm reading fiction, but if an author makes reference to an historical event, or even their use of medical and police procedures, I want it to be as authentic as possible. Call me silly, but I like to take something away from everything I read, even my romantic-suspense. My favorite thing about book blogs is when I discover a new author! I got completely burned out on historical romance. It was all I read for 10 years. I have discovered that I love romantic suspense and have added the Against series to the top of my TBR list! I went to college in LA and occasionally visited the Sunset Strip for a concert so I know the area and will enjoy a story based in that area! It sounds like you had a lot of fun writing this book. And including your husband made it all the better! Please enter me in the draw I would be interested in reading your book to watch how you did the setting. Congrats to Kat on the new release. I'm a fan of the Against books and look forward to reading "Against the Night." Loved the first four books in the series - can't wait to read AGAINST THE NIGHT! jtcgc at yahoo dot com! I just adore romantic suspense. All that heightened emotion to go with the thrills! And now I want Mexican food. Darn it! I started reading romance novel but I was missing the intrigue, the mystery, and the suspense from the mystery books like the Phyllis A. Whitney and Sherlock Holmes and so many mystery writers. I like the suspense but need the romance to make the characters real and grounded. Your books are great! Looking forward to reading your new book. This book is on my Amazon Wish List, and it looks like a good one. I love the line in the blurb "and the body of…well, isn’t that what he’d expect from an exotic dancer."